Centaurus A is the closest radio galaxy to us and is hosting an Active Galactic Nuleus (AGN) in its centre. It is believed that the twisting of magnetic fields in the accretion disk around the central supermassive black hole collimates the outflow along its rotation axis, so a resulting jet of plasma emerges from each face of the accretion disk. These jets emit strong synchrotron radiation which is ultimately detected on Earth as radio waves (Centaurus A is one of the strongest radio sources in the sky). 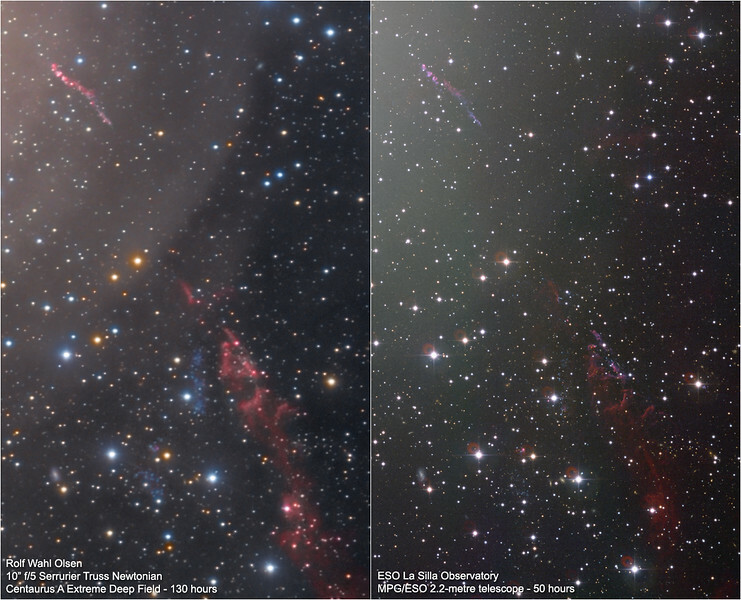 Two large lobes on opposite sides of the galaxy are the main feature in radio images. This illustrates the effects of Relativistic Beaming, where the jet that is pointed more towards us appear much brighter than the opposite facing jet. This is a common feature of active galaxies with jets and the same effect can be seen in for example the giant elliptical galaxy Messier 87. Interestingly, possible shock fronts from the bottom facing jet seem to also have triggered a burst of star formation in the surrounding gas, visible as a prominent sprinkling of faint blue stars scattered around the left of the outer red filament.